Paxton was one of the Diesels who took over the Sodor Steamworks. He later laughed at Flynn for not being able to rescue Thomas. Paxton is a young Diesel who likes the steam engines, especially Thomas. He can be a bit gullible, which sometimes enables the other Diesels to take advantage of him. 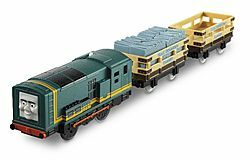 Paxton is a BR Class 08 Diesel shunter painted green with yellow lining.